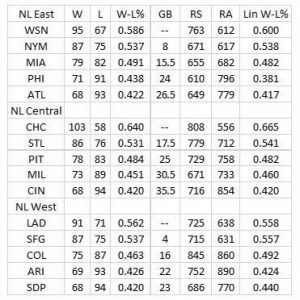 The table below shows for each of the NL teams their actual 2016 winning percentages (W-L%) along with their expected winning percentages (Lin W-L%), calculated using my linear formula Lin W-L% =.000579*(RS – RA) +.50, RS is runs scored and RA is runs allowed. My choice to win the NL East is the New York Mets. If healthy the Mets starting rotation of Noah Syndergaard, Jacob DeGrom, Matt Harvey, Steven Matz (currently injured), and Zack Wheeler could be the best in the Major Leagues. Robert Gsellman will be a great temporary replacement for Matz. The loss of 16-game winner Bartolo Colon is a negative. The resigning of Yoenis Cespedes and Neil Walker bodes well for the offense. Moving Jose Reyes to third base give the Mets a dependable leadoff batter. Yes, the bullpen is a question mark and of course the health of the starting pitchers could bite the Mets. Granderson will be Granderson and produce his 20+ home runs. 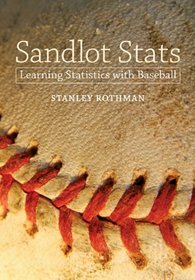 If healthy the Mets should increase their Lin W-L% to 0.580 from 0.538. Right on the Mets heels will be the Washington Nationals. The Nationals have a solid lineup around maybe the best two positional players in the NL shortstop Trea Turner and outfielder Bryce Harper and a starting rotation that should be top-notch, provided Stephen Strasburg stays healthy. The bullpen is a question mark. However, look for the Nationals to be one of the Wild Card teams. My choice for the NL Central is the 2016 World Champion Chicago Cubs. The Cubs are easily baseball’s most complete team. They have emerging stars all over the depth chart, an excellent rotation and bullpen, and a great defense. In 2016 their Lin W-L% was the highest in the majors which allowed them to have 103 wins. Look for over 100 wins again in 2017.The St Louis Cardinals have an experienced rotation and offensively an already balanced attack will get stronger with the addition of center fielder Dexter Fowler. The Cardinals will battle for the second Wild Card. The Los Angeles Dodgers should repeat as NL West winners. The Dodgers brought back all the stars they needed. With Clayton Kershaw healthy and shortstop Corey Seager improving on his National League Rookie of the Year season the pitching and offense remain strong. The biggest addition for 2017 was acquiring Logan Forsythe from the Rays. Forsythe fills their hole at second base and gives them a sorely needed right-handed bat. The Dodgers should improve their Lin W-L% from last year’s 0.558 and win 93+ games in 2017. Right behind the Dodgers will be the San Francisco Giants who arguably have the best lefty-right rotation duo in Madison Bumgarner and Johnny Cueto. The signing of Mark Melancon improves their bullpen. Yes, the Giants will battle the Cardinals for the second Wild Card. To summarize the three divisional winners in the NL will be the Mets, Cubs, and Dodgers. A fight exists between the Giants, Cardinals, and Nationals for the two Wild Cards. My choice for the two Wild Card teams are the Washington Nationals and the St. Louis Cardinals. In 2017 we will see a World Series between the Boston Red Sox and the Chicago Cubs. Last year the Cubs broke their 108-year drought and in 2017 will extend their WS winning streak to two. Yes, the Cubs will repeat as World Champions.